​How to Pray the Rosary. Rosary beads help Catholics count their prayers. More importantly, Catholics pray the rosary as a means of entreaty to ask God for a special favor, such as helping a loved one recover from an illness, or to thank God for blessings received — a new baby, a new job, a new moon. On the crucifix, make the sign of the cross and then pray the Apostles’ Creed. On the next large bead, say the Our Father. On the following three small beads, pray three Hail Marys. On the chain, pray the Glory Be. Skip the centerpiece medallion, and on the ten beads after that, pray a Hail Mary on each bead; on the chain, pray a Glory Be. 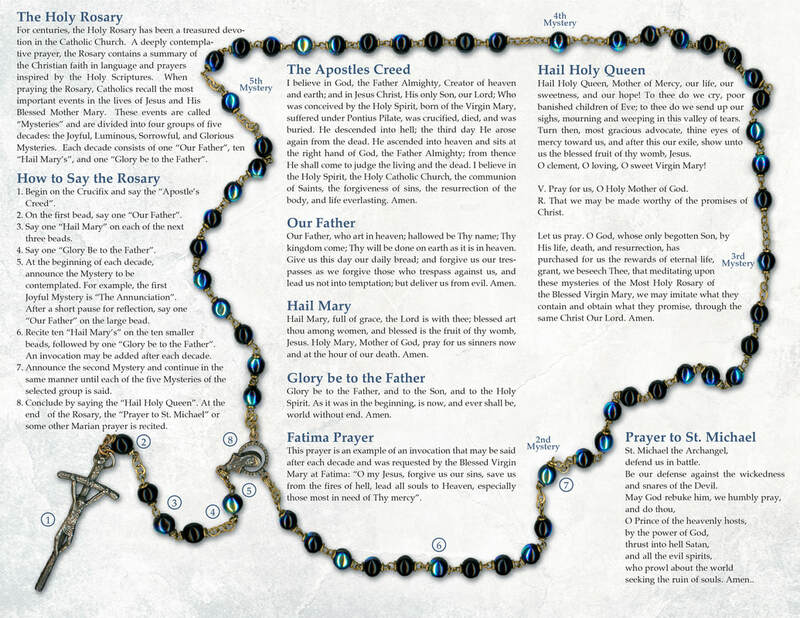 Although a decade is 10, these 12 prayers form a decade of the rosary. Many Catholics add the Fatima Prayer after the Glory Be and before the next Our Father: O My Jesus, forgive us our sins, save us from the fires of hell and lead all souls to heaven, especially those in most need of Thy mercy. Amen. Repeat Steps 5 and 6 four more times to finish the next four decades. At the end of your Rosary, say the Hail Holy Queen. Hail, Holy Queen, Mother of mercy, our life, our sweetness, and our hope. To thee do we cry, poor banished children of Eve, to thee do we send up our sighs, mourning and weeping in this valley of tears. Turn then, most gracious advocate, thine eyes of mercy toward us; and after this our exile show unto us the blessed fruit of thy womb Jesus, O clement, O loving, O sweet Virgin Mary. O God, whose only-begotten Son, by His life, death, and resurrection, has purchased for us the rewards of eternal salvation; grant we beseech Thee, that meditating upon these mysteries of the most holy Rosary of the Blessed Virgin Mary, we may imitate what they contain and obtain what they promise. Through the same Christ our Lord. Amen.